Monogram Bohemian Ikat pattern duffle tote bag. Going away for a weekend trip on business or pleasure? You will need a large and strong bag with lots of space to hold your outfits, shoes, cosmetics and also be able to separate your papers and documents. Our stunning duffle offers ample storage, with a main compartment, front zip pocket, and zippers that open and close easily. It also features a fabulous, modern Ikat design of flowing blue and white with hot pink trim that sets this duffle apart from the rest. 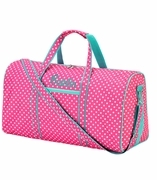 Add the matching lunch tote bag search WB-M380MARLEE or backpack item WB-M360MARLEE for a complete travel set. Monogram Boho Ikat duffel bag measures 21"W x 14"H, 10" across the bottom. Lined with over the shoulder carry strap and zip closure.